Barcelona Photoblog: La Monumental Bullring in Barcelona, Opera House or Roman Amphitheater? La Monumental Bullring in Barcelona, Opera House or Roman Amphitheater? 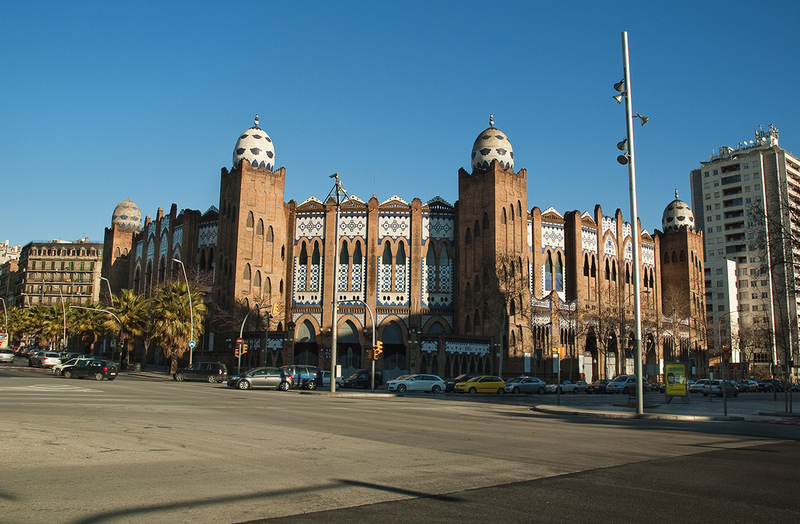 This is Plaza de Toros La Monumental, a building that after 2012 will not witness anymore bull fights by decree. I have to admit I always found odd that such beautiful architecture gave shelter to so wild an activity. As I said here in the past, I have nothing against traditions but animals don't deserve human cruelty no matter how justifiable it seems. Of course killing bulls is associated to Spanish spirit, it has become a sort of symbol and it is deeply rooted in the history of part of this country, a lot of families make a living thanks to this business, many others admire bullfighters' courage and enjoy their braveness, their art and approach the whole performance as a play or an opera divided into different acts leading to a climax and a grand finale. It is that final act that I find useless, sad and allow me to say, savage. At that point, the theater becomes a Roman amphitheater and the stage turns into a bloody sand pit. And you may say, we kill cows everyday to feed on them, don't we? If you come to think of it, we are no different than beasts, although they do not hunt just for the sake of hunting I'm afraid. Again another case of absurdity in this world of ours. Whenever I come across La Monumental I will always prefer to contemplate the architecture and forget about human follies. Beautiful architecture! Love the photo! I would definitely prefer to contemplate this beautiful architecture too, Carlos. You expressed to perfection all that I have thought regarding bullfighting since seeing one (and only one) fight in Mexico when I was on vacation in college. I am glad there is a decree that changes the use of this structure. This afternoon i'll pay more attention to the building. You never realize what's in your own city! Why not doing it like in Portugal, where they don't kill the bulls??? I suppose the killing speaks to a darker side of some people. Like fox hunting in the UK. I agree totally with your opinion. It is a good step to stop those old habits. The building can maybe used as a theater, as in Italy. Beautiful building! In Africa they also have a thing about killing bulls. Must be a sort of primeval hangover from an earlier existence. Sadly, many of us have moved on and are profoundly shocked by such behaviour. Then, as you say, we still eat beef with no thought as to how the animal suffered. But going to a death for fun???? More than two decades ago that I visited a bull fight. Surely this place breathes history, nicely set in scenery by your writing/picture. Please have a good Sunday.